Delivering smart connected devices that are IIoT ready means embedding Internet technologies like WIFI and web services natively into those devices. For example, Variable Speed Drives are essential to industrial processes by way of providing information on motor use and other devices like sensors and relays provide information on the device lifecycle. Embedded digital services also become critical to support process optimization. For example the new series of Altivar Process drives with built in web technology standards, Ethernet connectivity, intelligence and asset management or energy management features deliver additional contextual information, including real time events, alarms, drifts, and historical data. An edge gateway will aggregate data collected from various sources and deliver real-time business information to the right people at the right time. This is the key interface between the Internet world and the process (the things). 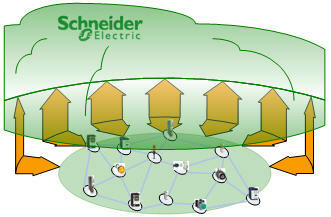 It also facilitates value-added services independent of the control system. Supporting this vision is the new Magelis GTU HMI which offers the flexibility of combining a CPU box with a choice of display, including a Wireless LAN enabled display. The edge gateway ensures a high level of performance and connectivity to address the critical needs of the IIoT platform. Digital applications and services are critical to end users achieving the business performance gains promised by IIoT. Simple data collection must be extended to include analytics that deliver pertinent and valuable business information. Some examples of such applications and services include installation optimisation, asset management and protection, condition based monitoring, augmented reality applications and OEE calculation, among others. A platform built on an open and collaborative environment will allow selected partners to develop specific applications that extend offerings and reach to help deliver the promise of IIoT. 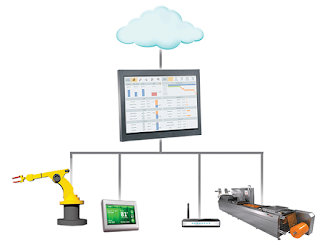 A consistent development environment with governance and processes will enable easy integration of IIoT platforms. The next blog post offer expert perspectives on subjects such as SMART Machines and how they contribute to the future of the industry.